"A simple Asian dish with a savory-sweet bite. If you don't have plum jam, you can use apricot preserves instead. Serve with baked squash and wild rice mix, if desired." Preheat an oven to 350 degrees F (175 degrees C). Spray a baking sheet with cooking spray. Season the chicken pieces with salt and pepper to taste and place skin-side-up onto the prepared baking sheet. Bake in the preheated oven for 20 minutes. While the chicken is baking, stir together the plum jam, 1 1/2 teaspoons pepper, ginger, and horseradish in a small bowl. 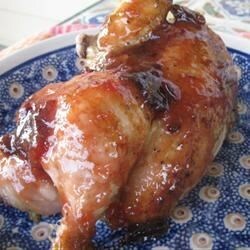 After the chicken has baked 20 minutes, brush with the plum glaze and return to the oven. Continue baking until no longer pink at the bone and the juices run clear, 20 to 30 minutes more. An instant-read thermometer inserted near the bone should read 165 degrees F (74 degrees C). Delicious, moist, and couldn't be easier. The glaze flavors and proportions are just right. I'm sorry but this dish just didn't work for us. I followed the recipe exactly as written, but the inside part of the chicken didn't get any flavor. This was delicious - the combination of plum jam and horseradish! I will definitely make this again.